Nisha Coleman is a writer, storyteller, and musician based in Montreal. Self-Exile won the 2016 Centaur Award and was featured at the 2017 Wildside Festival. Coleman’s memoir BUSKER: Stories from the Streets of Paris recounts the years she spent street performing in Paris and was published in 2015. In the same year she collaborated with the Banff Centre for the Arts to create a multimedia interactive website based on the memoir: www.buskerparis.com. Coleman has performed at events such as Yarn, Confabulation, Raconteurs, Ladyfest, and ZooFest and her work has been featured on CBC, PBS, MAtv, Risk! and No More Radio. She is an artist fellow at The Hermitage Artist Retreat for 2017-18. Is it better to be loved for who you are not, than rejected for you are? Born on a swamp to hippie parents, Nisha Coleman had an unusual upbringing. 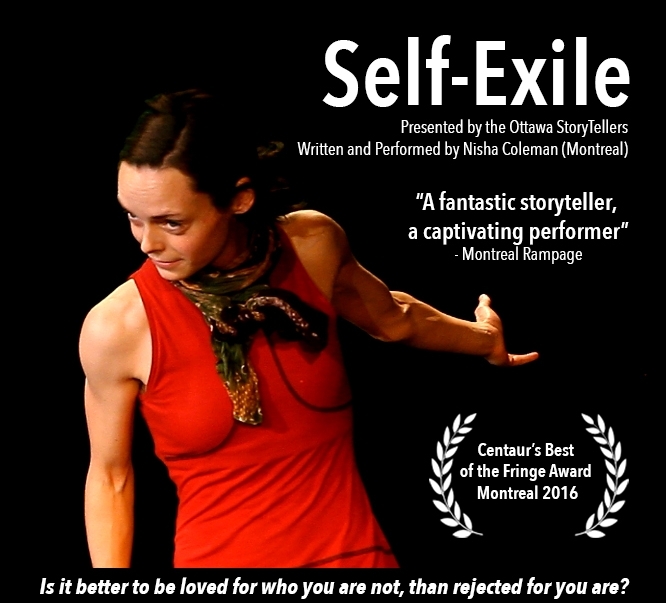 Her solo storytelling show, Self-Exile, transports the audience through key life events, from trauma to triumph, toddler to young adult, from a swamp in Northern Ontario to the streets of Paris.